Chennai’s residential market remained stable this quarter despite affirmative buyer sentiments and approaching festive season. Although the city witnessed higher number of new launches as compared to the other cities, developers refrained from increasing prices and displayed cautious optimism. This limited the growth of average capital values in the city. The Jul-Sep 2015 quarter saw multiple developments that infused positivity among all real estate stakeholders in the city. However, experts believe that even though the city had been largely resilient to the real estate downturn, it recorded almost 25 months of unsold inventory. Buyers seemed to be gradually ending their wait-and-watch mode as enquiries witnessed a rise in the third quarter of the year. 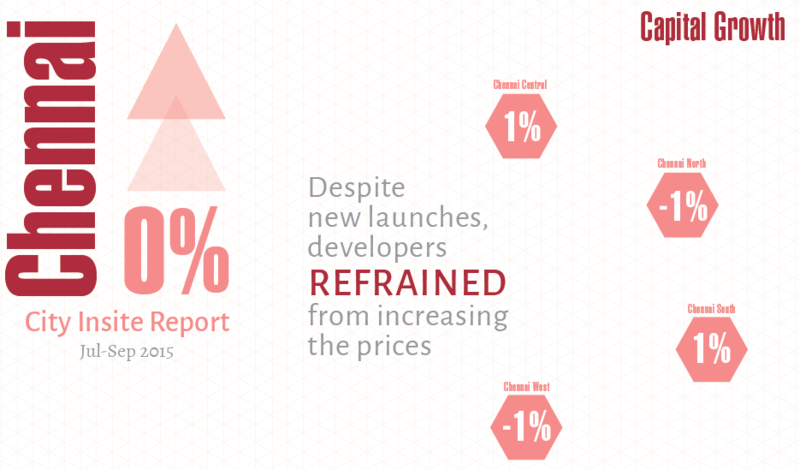 Developers also expect the RBI rate cut to positively impact sale volumes in the coming months. Steps by the state government such as the proposal to increase floor space index (FSI) in peripheral areas and the announcement to have a single window clearance system also contributed to the burgeoning positive sentiment. On the back of a slightly weakened residential sector, the commercial segment picked up pace in the last six months. The third quarter of 2015 saw multiple office space absorptions in the city, particularly in the South. For instance, private equity player Brookfield Asset Management bought 80 per cent stake in an upcoming industrial park near Sriperumndur, while Yes Bank absorbed 4 lakh sq ft of office space in Ambattur. The Southern corridor, particularly the Grand South Trunk (GST) Road and the Old Mahabalipuram Road (OMR), saw maximum number of new launches in Jul-Sep 2015. Residential micro markets along these corridors also saw the highest rise in capital values. One of the key factors that dampened the otherwise improving buyer sentiment across the Chennai residential market was the fund crunch and persistent tiffs concerning the expansion of the Chennai metro, which is otherwise touted as the primary growth stimulator for the realty market. 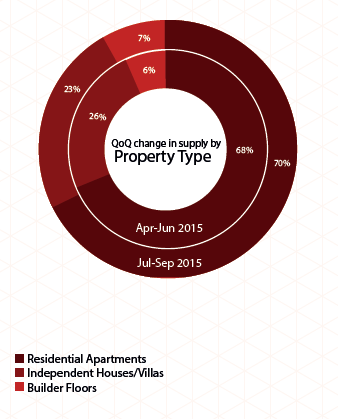 Chennai residential market remained largely stable in Jul- Sep 2015 with no rise in the average capital values. This was in contrast to the one per cent rise in capital values the city observed in the previous quarter. While more than 50 per cent of the tracked locations recorded a rise of 2-10 per cent in capital values, a drop in values to the tune of 1-11 per cent in almost 40 per cent of the localities restricted the average price growth. 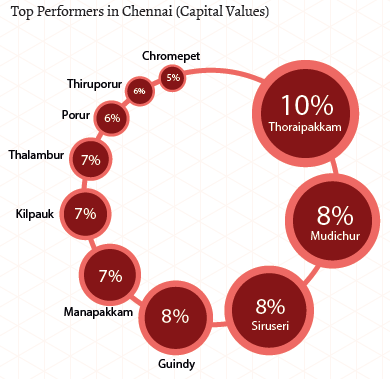 Nearly 70 per cent of localities that witnessed a rise in capital values were in South Chennai. The list of top ten performing localities in the quarter also highlighted this trend wherein eight localities were from the south. Persistent demand from both residential as well as commercial sector ensured a buoyant market in South Chennai. Locations along major corridors such as OMR, GST, East Coast Road (ECR) and Poonamallee Road witnessed maximum capital appreciation to the tune of three to five per cent. These corridors also saw the highest number of new launches in the city. 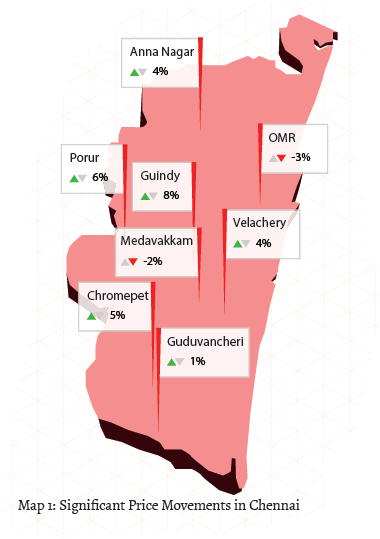 Locations along these corridors such as Thoraipakkam, Siruseri, Guindy, Kilpauk, Porur and Manapakkam witnessed a price rise of 5-10 per cent in Jul-Sep 2015. Strengthening of property prices, despite increased supply underlines the high residential appeal of these locations. Enhanced connectivity due to the Outer Ring Road and other road infrastructure propelled capital values in Mudichur by eight per cent. Premium locations noted a negative trend in capital values due to dismissive investor interest and subdued demand. Valsaravakkam, Virugambakkam and Mugalivakkam recorded a significant drop in property prices. The half yearly analysis of the rental market in Chennai reflected a passive trend with negligible average rental growth. 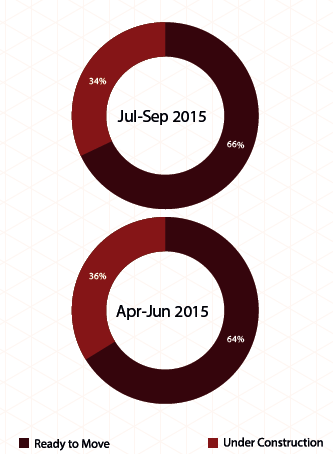 The market remained largely subdued in Jul- Sep 2015 as compared to the Jan-Mar 2015 quarter. Barring a few exceptions such as Ambattur and Madipakkam, none of the tracked localities in Chennai registered any hike in rental values. Ambattur capitalised on the affordability tag as well as proximity to Anna Nagar, which hurt tenants’ pocket more dearly. Moreover, new gated communities also lifted the rental demand up. Improved connectivity due to a new Mass Rapid Transit System (MRTS) station at Velachery, which is about 3km away from Madipakkam, provided landlords the opportunity to increase rents in the locality. Values shot up by eight per cent since Jan-Mar 2015. The extension work of this railway line is in process and once completed, it will pass directly through the locality. Oversupply of ready units in South Chennai, particularly along the OMR, resulted in a demand and supply mismatch. Values declined by three to eight per cent in localities such as Thiruvanmiyur, Padur and Sholinganallur, among others. Premium localities across the city lost sheen in the both capital and rental market as new peripheral areas developed to offered residential projects with all amenities at a competitive price. The 2BHK category was the most supplied for rent in the city. The maximum concentration of the same was noted in South Chennai. Localities such as Medavakkam, Chrompet, Madipakkam and Velachery recorded the highest supply of these units. The zone also posted the highest share of 3BHK units available on rent. Analysis of the residential supply in Chennai during Jul-Sep 2015 reflected the positive yet cautious mood of developers and buyers. South Chennai being the most preferred residential zone contributed more than 60 per cent of the total housing stock in the city. In line with persistent demand, mid-income housing continued to be the most supplied category. At the city level, apartments continued to be the most supplied property type with their availability inching up marginally from the previous quarter. With over 20 per cent share, villas and independent houses also contributed to the residential stock, highlighting the underlying demand for larger homes in the city. More than 60 per cent of the supply in all the three property types – builder floors, apartments and independent houses and villas – was concentrated in South Chennai. This may be attributed to a slew of new launches in the southern part of the city in Jul-Sep 2015. Out of the total apartment stock available in each zone, Central Chennai has the maximum share of ready units (over 70 per cent). Delays in deliveries coupled with launch of new residential projects meant that both South and West Chennai offered the maximum share of under-construction apartments. Except in the South, all other zones recorded more than 80 per cent supply of ready villa/independent houses. Under-construction villas and independent houses were most common in South Chennai with more than 40 per cent of the total supply share. Limited demand for premium properties compelled developers to reduce the ticket size of their housing units. This impacted the supply trend in the city with developers concentrating on building properties priced between Rs 25 and 60 lakh. The mid-income (Rs 25-40 lakh) and the high-income housing (Rs 40-60 lakh) categories together formed more than 50 per cent of the supply share in the city. Mid-income housing segment remained the dominant category in all zones expect Central Chennai. It formed more than one-fourth of the supply in the South and North, while in the West, it constituted almost one-third of the residential stock. Supply in luxury and ultra-luxury housing categories stood unchanged from the previous quarter, indicating limited new launches in these segments. However, the two categories aggregated more than 35 per cent of the total residential stock in the city, reflecting high unsold inventory in these segments. In contrast to other zones, luxury properties continued to rule the roost in Central Chennai. Ultra-luxury housing (Rs 1-5 crore) formed almost half of the total supply while the luxury segment (Rs 60 lakh - Rs 1 crore) contributed to one-fourth share of the supply in the zone. More than 75 per cent of these properties were ready to move. This trend was visible even at the city level, indicating a lack of new launches in the luxury segment. At the city level, affordable properties priced below Rs 25 lakh formed only about 10 per cent of the total supply. In North Chennai, it accumulated 12 per cent of the total residential inventory while it stood lower than 10 per cent in Central and South Chennai. Noticeably, more than 50 per cent of the supply in all zones except Central, was captured by inventory configured as 1BHK units. 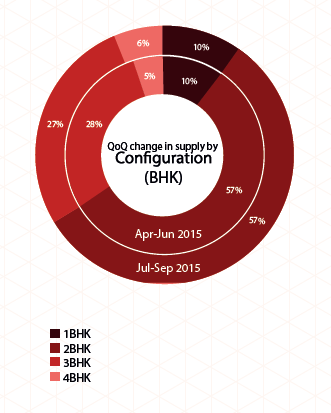 Supply in different BHK categories remained almost unchanged in Jul-Sep 2015 as compared to the previous quarter. Persistent demand ensured that the 2BHK category continued to capture more than half of the market supply. Except in Central Chennai, most 2BHK units were priced in the range of Rs 25-40 lakh across zones. Developers reduced the size of these units from a typical 1,100 sq ft to around 900 sq ft in order to cater to the budget preferences of buyers. In Central Chennai, more than 40 per cent of the available 2BHK units were priced between Rs 60 lakh and Rs 1 crore. Larger units have always found preference in South Chennai. In line with this trend, 3BHK units continued to be the second most supplied configuration in this part of the city. As per realty stalwarts, buyers look at 3BHK units priced between Rs 60-85 lakh. Supply in the category was aligned likewise with most 3BHK properties priced between Rs 60 lakh and Rs 1 crore across all zones except in Central Chennai. 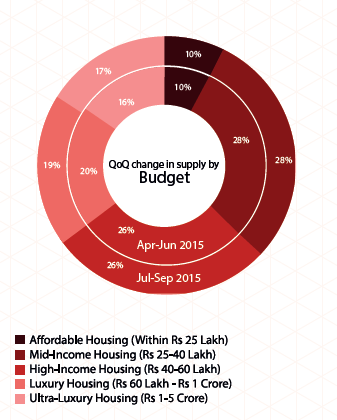 Supply of 1BHK and 4BHK units remained subdued during the third quarter of 2015. While more than 55 per cent of the total stock of 1BHK units was in the South, the zone contributed to about 70 per cent of the total supply of 4BHK units in the city. Most of the 1BHK units in South Chennai were ready to move, while 4BHK units had an equal share of ready and under-construction units. Even though Chennai’s residential market fared slightly better than its northern counterparts, developers remained defensive about new launches. This was reflected in the decline in the number of under-constructions properties in Jul-Sep 2015. The number of ready units inched up by two per cent in the current quarter. More than 65 per cent of the residential stock in the city is now ready for use. Barring West Chennai, the number of under-constructions units witnessed a decline of two to five per cent in Jul-Sep 2015 as compared to the previous quarter.